When is a stamp not a stamp? When it’s a TangleSTamp! It sounds like the beginning of a bad joke, but it’s actually a good question! My current collage work with stamps evolved from years of mail art, largely focused on the production of faux postage (artistamps) so when ‘real’ stamps took over my world, I was far from a philatelic purist. Most stamp collectors will tell you “if it’s not in the catalogue [Scott or Stanley Gibbons], it doesn’t belong in a stamp album”. Personally, though, I’m quite fascinated when I start investigating the background of a stamp only to find it isn’t in fact a genuine postal stamp at all. Is it a fake or a forgery? Honestly, I would be hard-pushed to tell; but no: more often it instead falls into one of the myriad sub-categories of the so-called ‘Cinderella stamp’. Ie, appearances can be deceptive. Local Post stamps – The closest cousin to the actual postage stamp. As with any other postal service, a local post stamp pays for carriage of correspondence from one point to another, but usually only within an area which is not otherwise covered by a national/official postal service. Most local posts are privately owned, and most commonly exist for carriage either within a remote area (eg a small island), or from that remote area to the location of a national Post Office, where standard fees would then be charged for onward delivery. One of the most famous examples of a functional local post service is that of Lundy Island. The original Pony Express in the US also falls into this category. Revenue stamps – Also known as fiscals, or tax stamps; used by a government agency or postal authority when a fee is due (/paid). Some of these are in fact featured in the Scott catalogue, despite the fact that they are not actual postage stamps. Bogus stamps – Cinderella stamps as a whole are often referred to as ‘bogus’ by philatelists, but this seems a little sweeping. Truly bogus stamps include those issued in the name of countries with no independent postal authority and no intention to use within any kind of actual postal service, and thus serve no actual postal function. These might include uninhabited islands (eg Eynhallow), or breakaway regions which have no independent postal service, local or otherwise (eg countries of the Russian Federation such as Buriatia). While there may be some genuinely ‘optimistic’ issues from countries which hoped for (but did not ultimately gain) independence (whose stamps would have otherwise been used), many stamps in this category appear to be issued solely with the intent to defraud collectors of genuine postage stamps. Stamps from the Republic of Maluku Selatan popped up in one of my earlier blog posts. Unauthorised issues – (a sub-category of bogus stamps, see above) Stamps purporting to be from an existing country with a valid stamp-issuing postal authority, but whose issue has not been authorised by the named country and therefore has no postal value (eg recent stamps from Afghanistan). When is a stamp not a stamp? When it’s a phantom! Phantom issues – Stamps in the name of countries which once legitimately issued stamps but no longer exist, and/or no longer issue stamps. In these cases, the place names have been ‘adopted’ by an independent stamp-maker, for creative purposes rather than with intent to defraud either postal authorities or collectors. The recognisable names (and therefore histories) blur the lines somewhat between bogus and fantasy, but are generally conceived without malicious intent. Bruce Henderson’s Occussi-Ambeno series is a good example (Henderson has created many other fantasy post stamps) although there are many more. When is a stamp not a stamp? When it’s a fantasy! When is a stamp not a stamp? When it’s an artistamp! Artistamps – Also known as faux postage stamps, sometimes postoids. 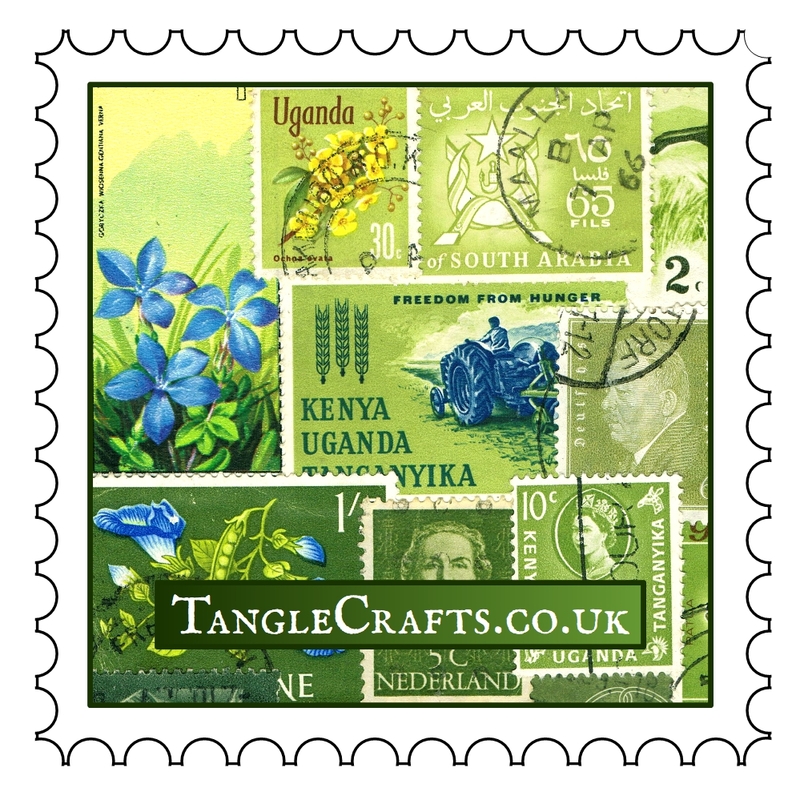 An artistamp is a tiny work of art (made using any medium of the artist’s choosing) made to resemble a postage stamp, and often used within the mail art network alongside the stamps necessary for postage. Popularisation of the artistamp can be traced to the fluxus art movement of the 1960s, where it became a means of circumventing the gallery system. However, artistamps naturally pre-date this period, and examples of hand-drawn postage stamps (for decorative rather than forgery purposes) date back as far as real postage stamps. The beautiful palm tree artistamps shown to the right were individually handmade by Donald Evans in the 1970s. If you can track a copy down, The World of Donald Evans is a wonderful testament to his work. Charity stamps & seals – In 1904, a Danish postal worker named Einar Holbøll invented the concept of the charity seal. This was to be added to the envelope in addition to the usual postage fee, in order to raise funds for charity. The Christmas Seal has become something of an institution in Denmark, with a new series issued annually (timeline/archive here). Many other countries and charities also issue their own similar seals. Advertising stamps – Sometimes known as poster stamps, as they are essentially miniature, stamp-sized advertising posters. Issued to advertise events and to promote individual companies dating as far back as the late 19th century. Although unintentional at first, I’m now building quite a collection of Cinderellas of various kinds. I try not to use them in my collages because whatever else they may be, they aren’t actual postage stamps. However, I really don’t mind if one slips through the net on occasion, because even while they ‘don’t count’ as postage stamps, to me, they are still a part of postal history. I’ve learned a lot of random stuff (my favourite kind of stuff 😉 ) and interesting stories because of them, many of which will probably pop up in future blog posts. While they may not belong in the album of the purist, Cinderella stamps definitely bear a second glance from the creative and curious.